October 12, 2012 Slasher StudiosKill Your Television! From Ruby Red Productions, the 23 minute short, Kill Your Television!, pays tribute to some of the greatest slasher flicks of all time. The main character, Molly, is stood up by her boyfriend and decides to stay home and watch Scream…alone. Oscar, the nerdy neighbor, stops by and tells the tale of the woman who haunts Molly’s very own apartment. As strange happenings begin to unfold, Molly fears that the worst is about to come true. Will she survive the evil haunts or is Oscar just playing with her mind? 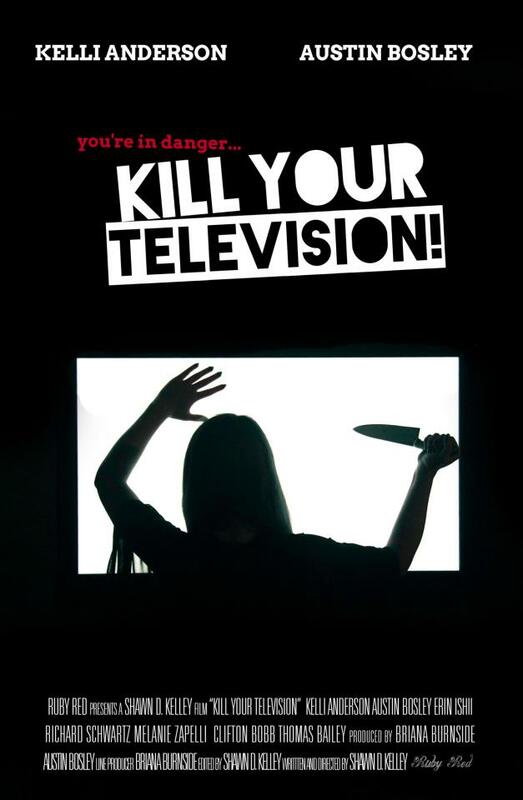 At first glance, Kill Your Television! looks like your average amateur YouTube horror video. Low budget, no set design and long opening credits usually spell disaster. But, this little film was definitely a sweet surprise. First of all, one has to love a Big Lots reference in any movie. As for the acting, other than the boyfriend, the acting is not bad at all for such a low budget movie. The editing was also a big surprise. The sequences of fast cuts meshed in with the long takes adds some well needed change of pace from time to time. The story itself is the selling point for me. They take the ever so popular film Scream and use it to enhance the story line. The fact that the character is in a slasher while watching a slasher is always a fun take on the genre. The intensity really does ramp up during the third act. The editing along with the score is able to help the intense movie going experience. With a little help, a reshoot of this short could be festival worthy. Add in some set design to eliminate the empty space on the walls, run a few more rehearsals with the cast, and amp up the overall production value and Ruby Red would have no problem getting into a few horror festivals.